We had a real treat on Friday, August 7th. 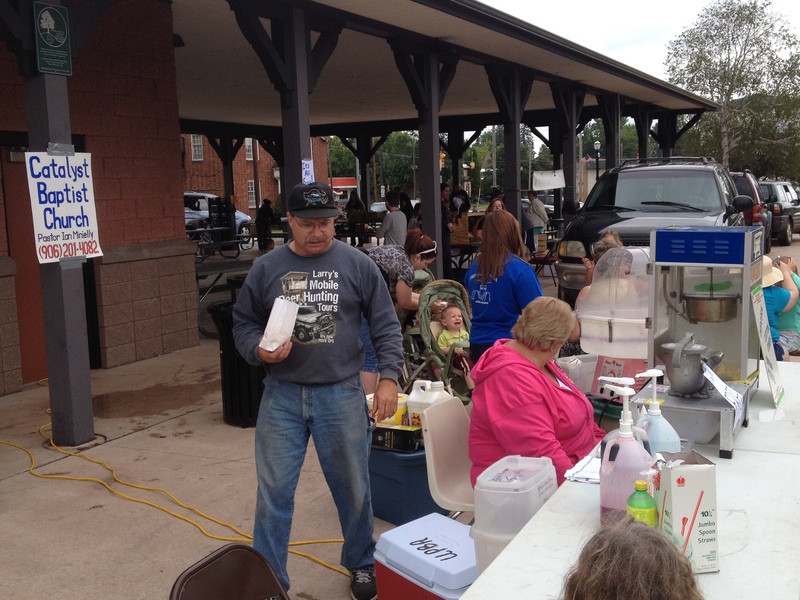 Our sponsoring church, First Baptist Church of Gwinn traveled to Ironwood and threw a block party with us. We set up in downtown Ironwood, co-located with the Farmers Market in Depot Park, blessing both crowds with fresh local food and goods, as well as free snacks, face painting, and a bouncy house. It was a great opportunity to meet people and let them know who we are. We will only be the new church in town as long as it takes us to meet people and become part of the community. We met and talked to about thirty people as the rain and low temps dissuaded many people from heading out doors. All in all it was a great time and Catalyst managed 100% participation from the people involved in the church, which is an impressive number any day of the week! Thank you City of Ironwood for allowing us to use the space and to the Farmers Market for being generous fellow hosts. We all had a great time and glorified our God.